How do we equip girls with a positive body image? It’s a perennial question that doesn’t seem to fade no matter the advances of women in society. Articles in the press in recent years suggest that girls’ attitudes toward their bodies are most influenced by their mothers. 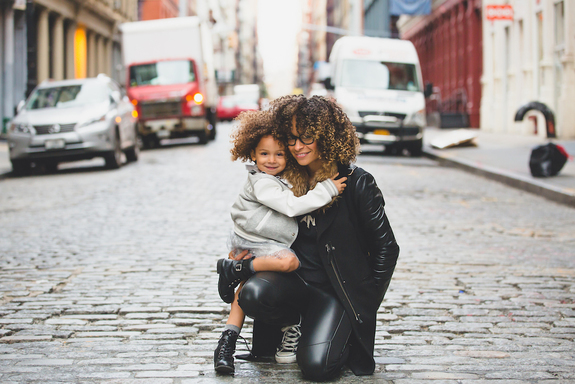 While media messages, stereotypes and peer judgments may contribute to poor body image, mothers are their daughters' primary teacher when it comes to attitudes toward the body and physical appearance. How do mothers influence their daughters’ body image a positive way? They focus their attention on the function and ability of body. When mothers appreciate their own and their daughters’ bodies for what they are capable of—strength, endurance, flexibility, resilience, defense against illness, healing—they help their daughters develop a positive perspective on their bodies. This one may be obvious, but is worth saying for those who have any doubts: Mothers should not make negative comments about their daughter’s bodies or body parts (e.g., “Wow, you sure got my thick ankles, didn’t you?"). It’s even best to keep favorable comments about body appearance to a minimum to prevent over-identification with the body. Another “no-no” is encouraging your daughter to diet or “watch her weight” (unless it’s medically necessary). Even if dieting is her idea, or she just wants to do it to “see if she can,” or because her friends are doing it, discourage it and take some time to discuss the issue with your daughter. Here’s the best tip I can offer: If you really want to help your daughter develop a positive body image, project one yourself—or at least fake it till you make it. For example, don’t comment negatively on your own weight, body size or body parts; try not to get upset, angry or defensive if your body is the subject of comments from others (e.g., your own mother, the guys on the construction crew); and don’t deprive yourself of healthy meals with the family in order to follow a restrictive diet. And, finally, just say “no” to judging other girls’ and women’s bodies, including celebrities. Watch yourself on this last one—for some reason, body size is considered fair game for ridicule in many social circles where negative comments about race, gender status and immigration status would not be tolerated. Projecting a positive attitude toward our bodies can be difficult for those of us who were conditioned early in life to over-identify with the body. As much as we may try to avoid transmitting conditioned beliefs and attitudes about our bodies to our daughters, as long as these beliefs endure deep in our psyches, it’s challenging. What can we do? Get to the root of the problem. Be mindful of negative thoughts about your body, many of which are subtle and barely on the conscious level. This includes thoughts along the lines of, “I’m a loser/failure/weak/flawed person because I’m overweight (or can’t lose weight),” or, “I won’t be happy/loved/accepted until I’m thinner.” Every moment you become aware of a negative thought about your body, try to drop it. Don’t give these thoughts energy—ignore them…let them go. They are of no benefit to you. In fact, they very much work against your efforts in the long run. This is not the fast route to a healthy body image. It is a life-long process of rooting out the very deepest, basic reasons for our struggles with body image.